Princeton astrophysicist David McComas will be the principal investigator for a science mission to sample, analyze and map particles streaming to Earth from the sun and from the edges of interstellar space. He is presenting the mission's goals and status at the international Committee on Space Research (COSPAR) meeting today in Pasadena, California. Slated to launch in 2024, the Interstellar Mapping and Acceleration Probe (IMAP) mission will investigate the heliosphere, which surrounds and protects our solar system, NASA officials announced June 1. In the boundary region of the bubble-shaped heliosphere, the solar wind—the steady flow of particles pushing out in all directions from our sun—collides with particles from the interstellar medium, the not-quite-empty space between stars. Most harmful cosmic radiation is shielded out in this boundary; IMAP will collect and analyze the particles that make it through, as well as others that are generated in this critical region. "IMAP simultaneously investigates two of the most important issues in heliophysics today—the acceleration of energetic particles and interaction of the solar wind with the interstellar medium," said McComas, a professor of astrophysical sciences and vice president of the Princeton Plasma Physics Labratory. The $492-million mission will include a suite of 10 instruments that will work together to resolve scientific questions about the solar wind and the interstellar medium, from basic—what exactly is out there?—to complex: How do solar particles interact with interstellar particles, and how does that interaction evolve in time and space? IMAP will also gather data about how cosmic rays are filtered by the heliosphere. These particles pose risks to astronauts and technological systems, and may play a role in the presence of life itself in the universe. 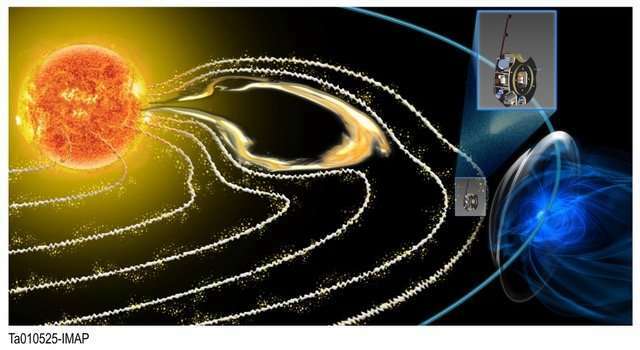 Much of Earth's protection from cosmic radiation happens because of the heliosphere, said Dennis Andrucyk, deputy associate administrator for NASA's Science Mission Directorate in Washington, D.C. "IMAP is critical to broadening our understanding of how this 'cosmic filter' works. The implications of this research could reach well beyond the consideration of Earthly impacts as we look to send humans into deep space." IMAP will orbit a point about a million miles sunward of the Earth at the first LaGrange point (L1), an astronomical location where the sun's gravitational pull is balanced with Earth's. IMAP will stay between the sun and the Earth, allowing some instruments to examine in-situ solar wind particles while others map the farthest reaches of the solar system. The mission is designed to achieve its baseline goals within the first two years, but it has enough energy and consumables to survive at least five years at L1, to allow for even greater science returns. IMAP is a rotating satellite about the size and shape of a toddler merry-go-round, 6.5 feet in diameter and 2 feet tall (roughly 200 cm x 70 cm). All of the science instruments will run continuously as it rotates in space four times per minute. 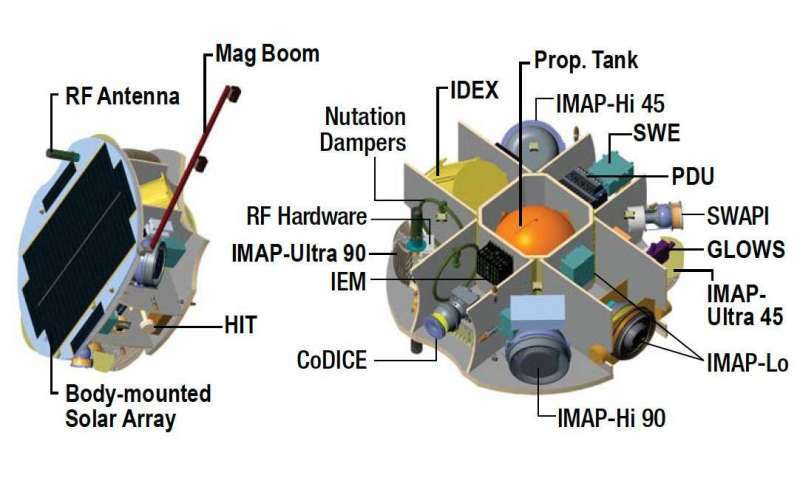 The 10 instruments on IMAP are "high-heritage, flight-proven" tools, meaning that they are very similar to instruments used successfully on one or more prior missions. Three of the instruments—IMAP-Lo, IMAP-Hi and IMAP-Ultra—will use energetic neutral atoms to "see" particles from the invisible heliosphere and beyond. The sensors will be calibrated in the same facilities as similar instruments from previous missions, allowing IMAP to build from the dataset that has been accumulating since 2008. The three IMAP instruments have higher resolution and many times the collection power of the previous missions (on average, 15 times, 25 times and 35 times, respectively, for the three instruments). Five instruments—CoDICE, HIT, MAG, SWAPI and SWE—will measure different components of the solar wind and energetic particles that will allow the detailed understanding of particle acceleration, as well as providing real-time data about the space weather heading toward Earth. The other two instruments, IDEX and GLOWS, will look at interstellar dust and ultraviolet radiation. As the principal investigator for the entire IMAP mission, McComas is leading the team that includes scientists from 24 institutions in the United States, Germany, Poland, Switzerland and Japan. He is also the lead investigator for the SWAPI instrument. "The IMAP science team consists of many of the world's leaders in instrumentation, data analysis, theory and modeling, and understanding of the global heliosphere," McComas said. Together, IMAP's 10 instruments will provide "the first comprehensive in-situ and remote global observations to discover the fundamental physical processes that control our solar system's evolving space environment." IMAP-Lo, a single-pixel neutral atom imager mounted on a pivot platform, will measure low-energy (5-1000 eV) interstellar neutral atoms of hydrogen, helium, oxygen, neon and deuterium. IMAP-Hi has two single-pixel imagers that will sweep a circle in the sky with every spin of the rotating satellite. They will measure mid-energy neutral atoms (0.4-15.6 keV) at 4° angular resolution. IMAP-Ultra consists of two identical imagers using slit optics to cover three-quarters of the full celestial sphere with each spin. It will measure high-energy (3-300 keV) neutral atoms with 2° resolution. The Compact Dual Ion Composition Experiment (CoDICE) will measure the composition and movement of two broad energy ranges of ions simultaneously, in order to advance our understanding of particle acceleration in the heliosphere. 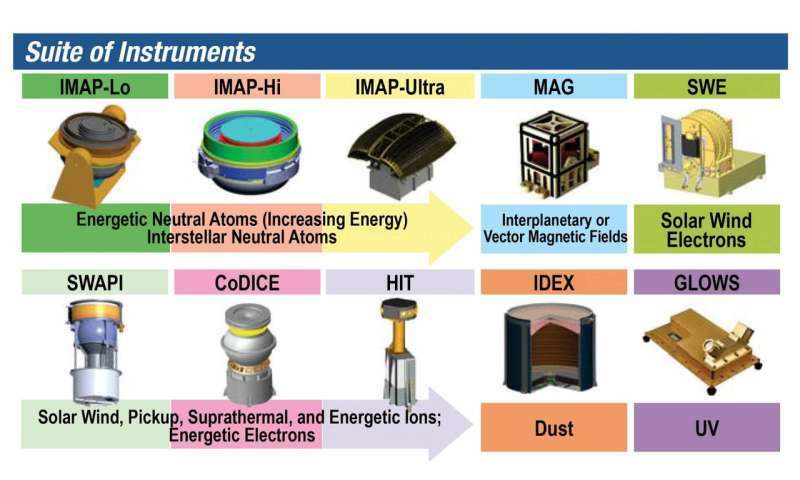 The High-energy Ion Telescope (HIT) is a spectrometer that will inventory the charge, energy, orientation and mass of ions from hydrogen to nickel, to determine whether they originate in the solar wind or the interstellar medium. MAG, a pair of identical magnetometers, will measure the local interplanetary magnetic field and provide new insights into the waves and turbulence of the solar wind's plasma. The Solar Wind Electron (SWE) instrument will measure the 3-dimensional distribution of thermal and suprathermal electrons from 1 eV to 5 keV. SWE is optimized to detect in-situ solar wind electrons at L1 in order to understand the solar wind structures and provide context for the energetic neutral atom measurements. The Solar Wind and Pickup Ion (SWAPI) instrument, which Princeton's David McComas is the lead investigator for, will measure the solar wind ions as well as hydrogen and helium "pickup ions" from the interstellar medium. The Interstellar Dust Experiment (IDEX) will provide the first accurate in-situ measurements of the flux, size distribution and chemical composition of interstellar dust particles flowing through our solar system. The Global Solar Wind Structure (GLOWS) instrument will measure the ultraviolet glow from interstellar hydrogen and helium, providing ionization, radiation pressure and solar wind measurements and allowing scientists to map out the structure of the solar wind.